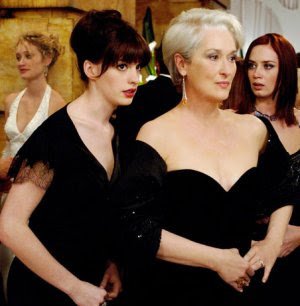 I got a copy of The Devil Wears Prada for my birthday in 2007, and for months, I couldn't stop watching it. The novelty kinda wore off after a while for some reason, and instead of watching it several times a month I probably watch it maybe once or twice a year. Still, each time I watch it, I enjoy it lots. Mainly because of my undying love for Anne Hathaway. In New York, there is a fashion magazine named Runway, which is where a million girls dream to work. Andy (Anne Hathaway) is an aspiring unfashionable journalist who gets the job of a lifetime: being the second assistant to the Editor-in-Chief Miranda Priestley (Meryl Streep). She is introduced to a world of fashion and models, never being late for anything and moving mountains for her evil boss. All the while trying to keep her personal life intact. Miranda: 'This... stuff'? Oh. Okay. I see. You think this has nothing to do with you. You go to your closet and you select... I don't know... that lumpy blue sweater, for instance because you're trying to tell the world that you take yourself too seriously to care about what you put on your back. But what you don't know is that that sweater is not just blue, it's not turquoise. It's not lapis. It's actually cerulean. And you're also blithely unaware of the fact that in 2002, Oscar de la Renta did a collection of cerulean gowns. And then I think it was Yves Saint Laurent... wasn't it who showed cerulean military jackets? I think we need a jacket here. And then cerulean quickly showed up in the collections of eight different designers. And then it, uh, filtered down through the department stores and then trickled on down into some tragic Casual Corner where you, no doubt, fished it out of some clearance bin. However, that blue represents millions of dollars and countless jobs and it's sort of comical how you think that you've made a choice that exempts you from the fashion industry when, in fact, you're wearing the sweater that was selected for you by the people in this room from a pile of stuff. Miranda: Do you know why I hired you? I always hire the same girl- stylish, slender, of course... worships the magazine. But so often, they turn out to be- I don't know- disappointing and, um... stupid. So you, with that impressive résumé and the big speech about your so-called work ethic- I, um- I thought you would be different. I said to myself, go ahead. Take a chance. Hire the smart, fat girl. I had hope. My God. I live on it. Anyway, you ended up disappointing me more than, um- more than any of the other silly girls. Andy: I don't think I'm like that. I couldn't do what you did to Nigel, Miranda. I couldn't do something like that. Miranda: You already did. To Emily. Andy: That's not what I... no, that was different. I didn't have a choice. Miranda: No, no, you chose. You chose to get ahead. You want this life. Those choices are necessary. Andy: But what if this isn't what I want? I mean what if I don't wanna live the way you live? Miranda: Oh, don't be ridiculous. Andrea. Everybody wants this. Everybody wants to be us. Emily: One time an assistant left the desk, because she, I don't know, sliced her hand open with a letter opener. Miranda missed Lagerfeld just before he boarded a seventeen hour flight to Australia. She now works at TV Guide. Andy: Man the desk at all times. Got it. Nigel: Andy, be serious. You are not trying. You are whining. What is it that you want me to say to you, huh? Do you want me to say, "Poor you. Miranda's picking on you. Poor you. Poor Andy"? Hmm? Wake up, six. She's just doing her job. Don't you know that you are working at the place that published some of the greatest artists of the century? Halston, Lagerfeld, de la Renta. And what they did, what they created was greater than art because you live your life in it. Well, not you, obviously, but some people. You think this is just a magazine, hmm? This is not just a magazine. This is a shining beacon of hope for... oh, I don't know... let's say a young boy growing up in Rhode Island with six brothers pretending to go to soccer practice when he was really going to sewing class and reading Runway under the covers at night with a flashlight. You have no idea how many legends have walked these halls. And what's worse, you don't care. Because this place, where so many people would die to work you only deign to work. And you want to know why she doesn't kiss you on the forehead and give you a gold star on your homework at the end of the day. Wake up, sweetheart. Got the message? This movie is so wonderfully scripted and makes us believe in this superficial world. Oh, and the film itself has some amazing performances, especially from Meryl Streep, Emily Blunt and Stanley Tucci. With outfits that literally make me die everytime I watch it.